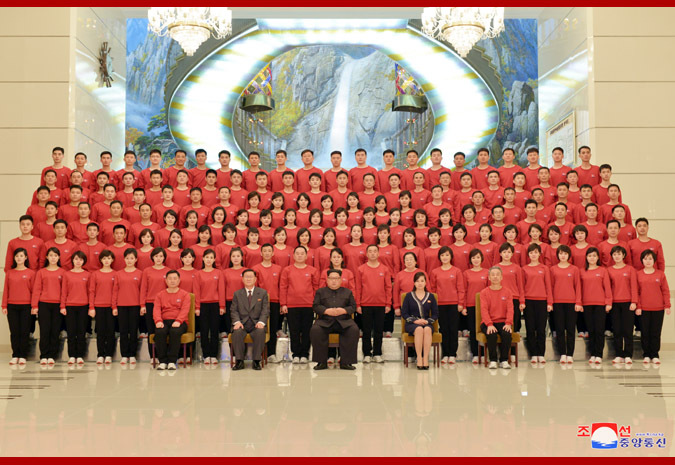 Pyongyang, February 13 (KCNA) -- Kim Jong Un, chairman of the Workers' Party of Korea, chairman of the State Affairs Commission of the DPRK and supreme commander of the Korean People's Army, met and had a photo session with the members of the Samjiyon Orchestra which returned home after successful congratulatory art performances for the 23rd Winter Olympics in the south side's region. Kim Jong Un warmly congratulated the orchestra upon its successes by conveying the warm mind of the people in the north who are hoping for the successful Winter Olympics and national reconciliation and giving great joys to the fellow countrymen in the south through its performances. After receiving a report on the atmosphere of the venues of the performances and echoes from the members of the orchestra, he said that he was also pleased that the fellow countrymen in the south including President Moon Jae In and his wife expressed satisfaction over the performances while warmly responding and cheering them. He gave thanks to the members of the Samjiyon Orchestra for successful performances at the highest level by preparing them in a brief span of time with their high artistic ability and sincere attitude and had a photo session with them.